This photo was taken in January. The "Take It!" 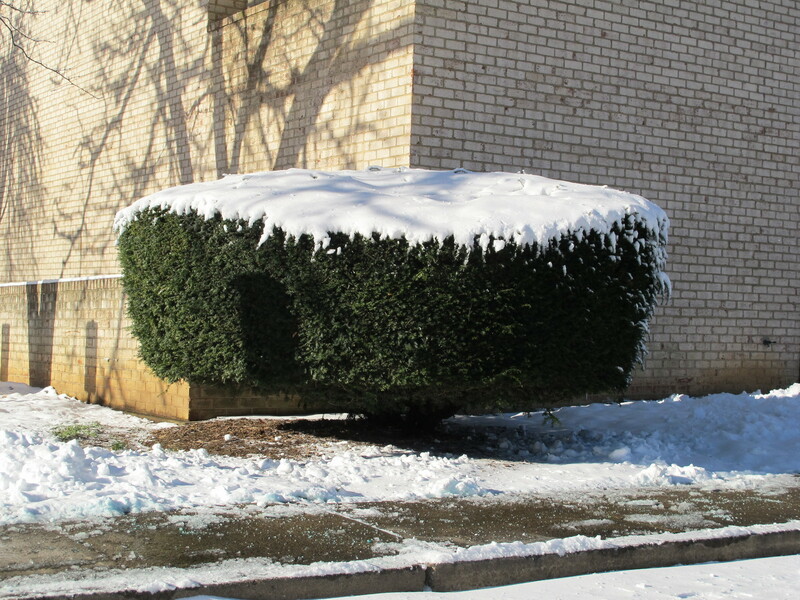 came from seeing this nicely pruned bush have a snow cap that made it take on the look of a cupcake. It was snow that made the topping thus the use of "cap" for the photo. No - it did not look good enough to eat - but it certainly was an eye catcher. The After Take: All who looked at this enjoyed it. It seemed to fit into the fanciful category of "eye candy." Here is hoping if you also live in a place where there is snow - that there may be some places where snow gathers that are unusual and take on a complement to that which it is covering. Wherever you can - make snow a joy. 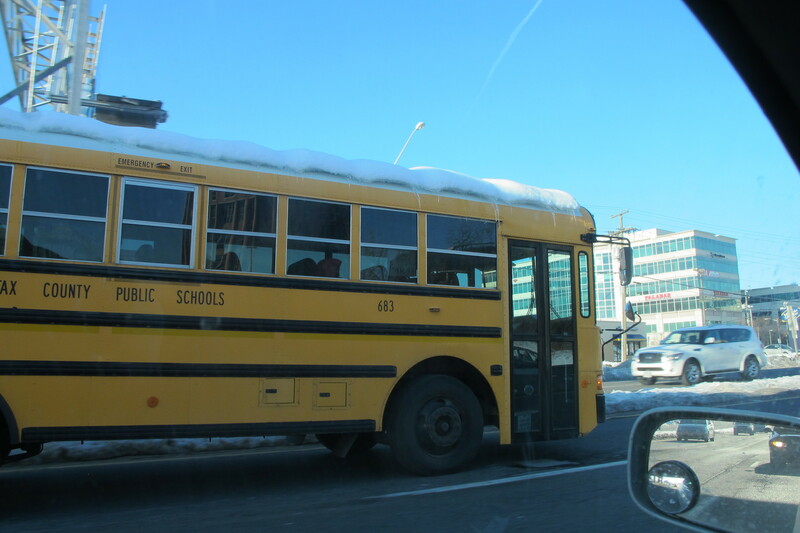 PS: Very recently - we were passed by a school bus that had snow on its roof. The sun had been out for a while and for some reason the roof of the bus had snow melt lines running at even intervals from side to side on the top. I think the lines were formed by seams in the metal roof where heat from within had helped to melt the snow in these strips. From the right angle - it looked as if the bus actually had a row of white pillows on the roof. It was rather common - but somehow magical in that here were children unbeknownst to them - on their way to school riding in a pillow topped bus - lol. I could not get my camera out fast enough to catch it at the most advantaged angle to portray the best of the pillow illusion - but did get the below photo where one can catch a hint of the end of the melt lines as they reach from the top to the side of the bus. Traffic moved - and so did we - but the image lingers on. The first one really does look like it could be like pastry art or something. For sure see the cup cake in it. I swear the observations you make I would nevr have noticed this. its very admireable. Weird that the snow doesn't blow off the top of the bus as it drives. Mustve been frozen on. I think I finally found a cup cake I would have reservations about eating.